Buy this item and earn 162 ClubPoints. The USB-C Travel Dock with Device Charging and Hub is the perfect solution for connecting a USB-C device to an HDMI, DisplayPort, or VGA display when in the office or on the go. Supporting HDMI and DisplayPort resolutions up to 4K at 60Hz - while also delivering power - enables the USB-C Travel Dock with Device Charging and Hub to meet your connectivity needs and handle critical tasks so that you can rest easy knowing that you have the connection you need. 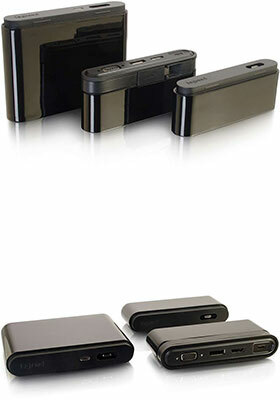 The modular system consists of three parts: Travel Dock Base, Hub* and Power Bank*. 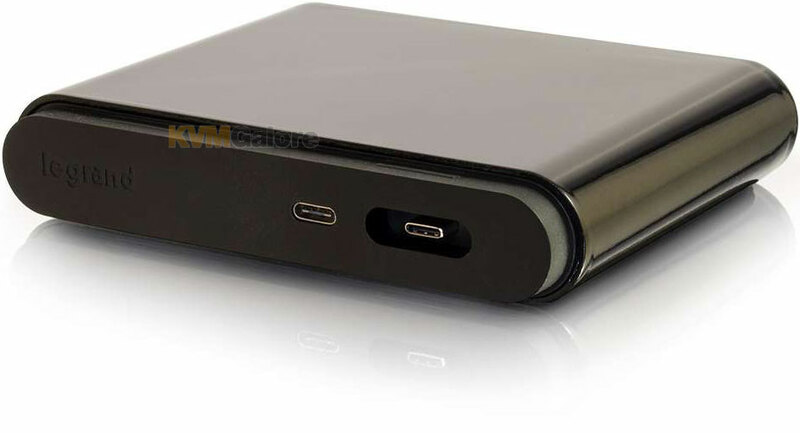 The main dock provides display connectivity with HDMI, DisplayPort and VGA as well as pass-through power delivery. The hub adds a Gigabit Ethernet port, 2x USB Type-A ports and a single USB Type-C port. Finally, the power bank module can be attached to the travel dock base in place of the hub module or it is available as a standalone device and provides 10,200mAh of battery capacity to charge your mobile devices (up to 35W). The travel dock is a great means to connect to nearly any display for that big meeting or presentation. The dock is purposefully engineered to allow a USB-C enabled computer or tablet to connect to a display with HDMI, VGA, or DisplayPort inputs and features a USB Type-C port with power delivery. 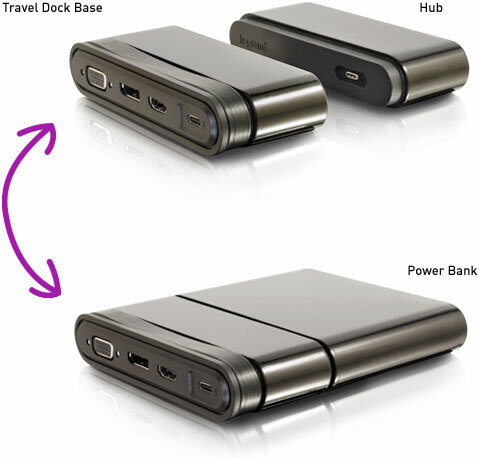 The hub brings additional connections to the travel dock to meet all connectivity needs. 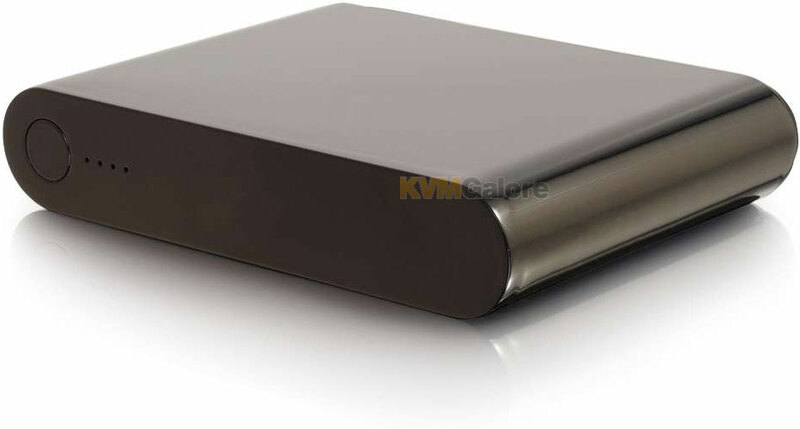 The hub is equipped with a USB Type-C port for plugging in mobile devices, two USB Type-A ports for connecting peripherals or portable storage, and an RJ-45 port for Gigabit Ethernet. Connect a USB Type-C power source to the travel dock to provide the necessary power for the hub to function. The included USB-C power bank puts power within reach when those power hungry devices need it the most. 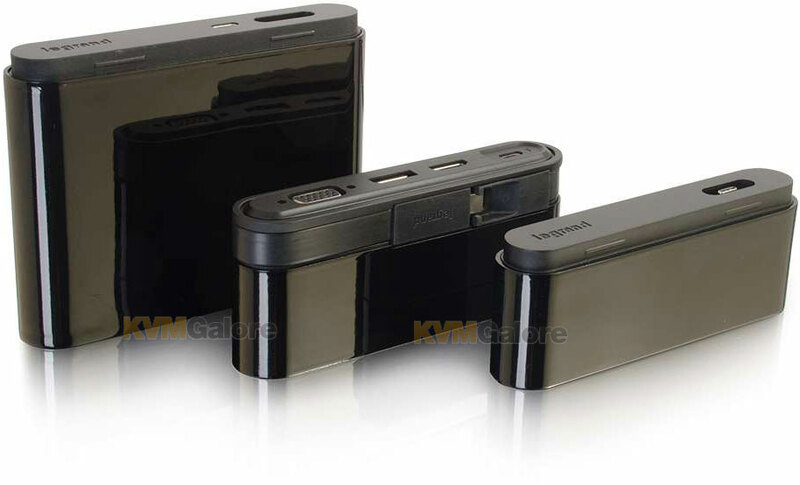 With a capacity of 10,200mAh, the high grade lithium battery is able to provide multiple charges for most smartphones or a partial charge for larger devices, like a laptop or tablet. 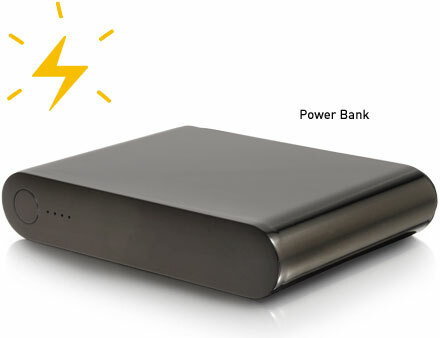 Simply attach the power bank to the travel dock base and provide power to the connected source device so that you can charge while the port is occupied with video connection, or use it by itself to charge your device. The LED lights on the power bank will indicate when it needs to be recharged. Connect a USB-C power source to the travel dock to provide the necessary power for charging the power bank. * The USB-C Power Bank and the Connectivity Hub cannot be connected to the USB-C Travel Dock at the same time.